In Real Estate. Go to AlLewisProfile.com for Info. Multiply Your Market Value & Income a Hundredfold / When was the last time you were invited into a $1/Million to $2/Million, or $4/Million to $6/Million dollar home or higher to give a listing presentation and told by the seller that they were only taking the time to see you because of your courteous contact and, following that, that they know the top agents in their area and are sure whom they are going to list with? By executing the programs shown on these outlines – one following another until we get the results we want – we’ll draw both Buyers and Agents to your property like metal shavings to a powerful magnet or bears to honey in greater numbers than any other cookie-cutter program on the market. Did I say cookie-cutter? The Main Thing, of course, is being associated with or in a listing program that works. Listing is Job One / Many great careers in real estate have been sidetracked by action orientations that put selling ahead of listing. (1) To build a sustainable career in real estate you must become a successful Listing Agent whether you work full-time or part-time weekends only. (2) You must know that a sustainable career as a Selling Agent follows listing success and never comes first. If you try to build a sustainable career in real estate working solely as a selling agent by showing property to discount oriented buyers and investors, holding open houses for other agents, and hauling internet-buyer-leads around from one neighborhood to another, one city to another or, even, one county to another sometimes for months on end until they give-in to buying (not even from you), you soon will be out of real estate. (3) To break into the high-end you must be in an over-the-top listing program that holds a patent on proprietary structured marketing that both gains listings and is effective at marketing them once gained; that monopolizes a position within a narrowly defined target market in such a way that competition doesn’t even exist; and, that is doable without prohibitive costs or demands of time invested. What follows is an introduction to the Real Estate Professionals’ high-end residential listing program under the banner of The Real Estate Fellowship. The Fellowship is a team-oriented apprenticeship to a work for both Associates and Fellows, whether new or experienced, that by cause or circumstance are not in an effective listing program at this time or not working at the “Top” or high-end of the market. "Duplicate with me, as your guide, my highly successful program for listing and selling Custom Homes, Estates and Resort-Oriented Residences in the local market (your market) with local identification. Learn an easier, more pleasurable, more efficient way of getting and doing business at the top of the market. Easy, because I have laid the groundwork, developed the programs and executed them to fulfillment four-decades running." We do not chase REOs, Short Sales, NODs or Loan Mods, nor do we seek discount-oriented buyers; instead we seek high quality equity-positioned sellers (listings) at the top or high-end of the market, qualified high-end buyers and quick closings. The “Top Job” in real estate, High-End Residential Listing and Sales, is not a job I can give you, but a position you can develop for yourself hand-in-hand with me, so to speak, by your adoption and adaption of my program in the local market or wherever you want to work. Whether an independently active Broker or a Broker or Agent associated with a real estate company you can work inside the Fellowship without changing broker-association. Fellows are not required to change broker-association and sign a Broker-Associate Licensee Agreement with broker Al Lewis, the Real Estate Fellowship, or Real Estate Professionals World Enterprise Marketing, nor does membership effect a job or association at the expense of your independence, though listing and selling under the Real Estate Professionals’ banner is an open ended possibility. It is a unique opportunity to grow your business by collaborating in a non-licensed affiliation with both (1) A broker/mentor that lists and sells at the top of the market and (2) A professional marketing company that specializes in the gaining of listings at the top of the market -- wherever located -- and the marketing of them once gained. Synergy – the working together of two things to produce a result greater than the sum of their individual effects – is the aim of the program and the relationship. This is a program for brokers and agents that really want to succeed, that are tired of being ineffective, timid or worst yet, second best. Even if these are your experiences to date, I will lead you to the higher place you seek. I look forward to our talking and working together soon. will bypass that curve completely (1) No down time sitting through endless hours of high-cost in-office training (2) No high-cost farming (no farming) (3) No dragged out business development program (4) No buying of leads or bench ads, or magazine ads, or online profiles on Zillow or Trulia or dot.Realtor or Realtor.com (5) No Google Adwords, Yahoo or MSN pay-per-click advertising campaigns (6) No high-cost website or website optimization schemes, and (7) No telemarketing or door-to-door prospecting. You will simply start at the top and stay there. The answers are found within a program introduction, job description and start-up pro forma titled / The Power of One: The Top Job in Real Estate. This detailed article will define for you exactly (1) How to break-into and sustain listing and sales success at the "Top" or high-end of the market under the umbrella of The Real Estate Fellowship and as an affiliate of Real Estate Professionals World Enterprise Marketing (2) It will help you determine your fit (3) It will define for you why this program is recession-proof, free of competition and Top of The Mark. To be in the market with an entirely new "Listing Program" for listing luxury homes, estates and resort-oriented residences within only fifteen-days, merely follow the instructions at the back; you will have the -- Top Job -- in real estate substantiated by a lifestyle exemplifying balance and an income exemplifying wealth and status. Talent and skill you have in abundance, I can assume this, but they must be channeled to be of value in the marketplace. To soar listing and selling real estate at the top of the market you have to have a story that makes you interesting, not a run-of-the-mill franchise rubber stamp, but a standout persona that satisfies the demands of a high-end selling situation worth paying attention to. 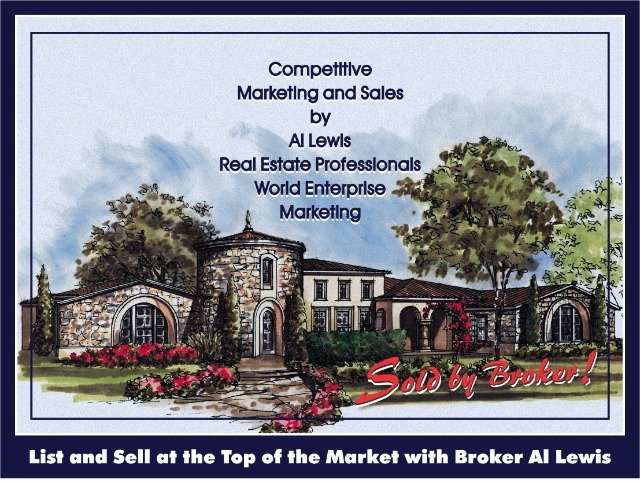 In affiliation with me and "Real Estate Professionals World Enterprise Marketing" you will have this. You are a concerto in the making, a large scale musical composition for a solo instrument accompanied by an orchestra, play your music and be recognized. If we want a thing we must have within ourselves the mental equivalent before we can either get it or do it if action is part of the equation as it most always is. The Real Estate Fellowship, its program, tools and structure for listing and selling at the top of the market is the image -- The Mental Equivalent or Bigger Thing -- and path that can multiply your market value and income a hundredfold; but you must act for this to happen.